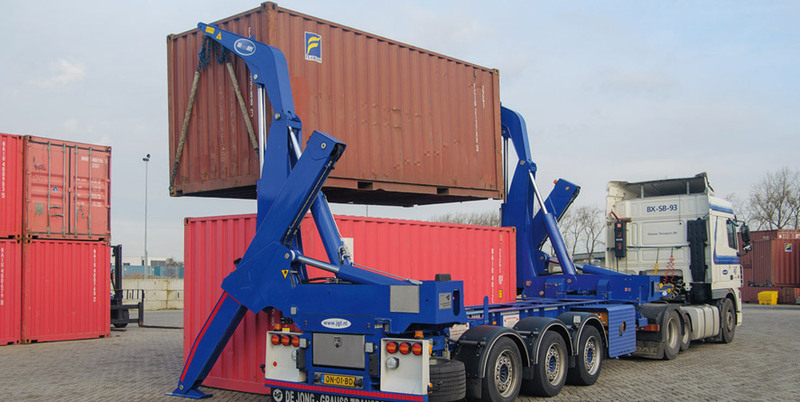 De Jong-Grauss Transport was already able to offer an extensive service for sea container transport, but with the arrival of the side-loader we can now offer our clients even better service. It gives us the option to load and unload containers on the desired spot, without outside assistance. If there are no facilities available for the loading and unloading of different sized containers this offers the solution. With the side-loader we can pick up or put down 20ft, 30ft, and 40ft containers as heavy as 35 tons without any problem and stack them two high. The revolving axles of our chassis allow us to load and unload in spots that are hard to reach. Our extensive safety software continuously calculates remaining safety margins during hauling and comes into action as soon as maximum values are reached. It goes without saying that our drivers have been well trained to operate the side-loader and ensure that your shipments are handled to satisfaction.